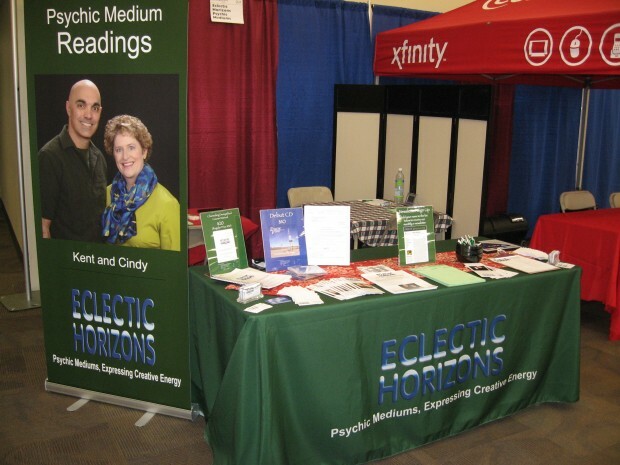 Attending a psychic, holistic, metaphysical, or body mind spirit celebration fair is one of the best ways for individuals new to spiritualism or psychic phenomena to get a feel for this work. The reason is that you can work with lots of different people and experience multiple styles and specialties in a short period of time at a cost that is generally well below each professional’s typical individual rates. In the Denver area, it is common for fair rates to be $1/minute, with readings typically lasting 20 minutes. Now that you’re sold on the value proposition, how can you prepare to get the most out of your $20 reading with each professional you see? Size Matters. First, decide whether you feel more comfortable attending a smaller psychic fair of 6-10 readers held at a metaphysical bookstore or a larger holistic fair where there are dozens of readers. Larger metaphysical fairs are not as frequent, typically only 2-3 times each year versus monthly or quarterly at most holistic bookstores, but the quantity of exhibitors and attendees at the larger fairs is exponentially greater than the bookstore fairs. The size of the fair is an important factor for you to consider. Both small psychic fairs and large metaphysical fairs have merit. Decide which is best for you. For me, I feel a larger venue with more professionals is the easiest way to get the most out of an afternoon of psychic exploration, so that is my recommendation, and the recommendation upon which I based the rest of my preparation guidance below. Research Readers. Most fairs have websites where you can read about the exhibitors before the event. Each exhibitor can provide a photograph and a short summary of the services and specials that will be offered at the upcoming event as well as information about any lectures or workshops that are being offered by the exhibitor at the fair. By reading the bios provided and viewing the pictures of the individuals, you can get a sense of whether or not this is someone you would like to spend 20 minutes with and from whom you would like to receive psychic guidance or spirit communication. Plan. When I am preparing to attend a metaphysical fair as an attendee (versus an exhibitor), I read all the summaries and then put together a short list of the people I would like to see. I usually set a budget for myself beforehand, and then develop a short list of 2-4 people more than my budgeted amount. My short list contains more people than my budget to accommodate factors that can only be identified at the fair. Some considerations you may encounter at the fair include: 1) The reader does not resemble his/her photo and something about their appearance or their energy vibration is off-putting to you; 2) The sign-up list is already full; or 3) The exhibitor is a no-show for the event. Map Approach. Once you’ve got a short list, consult a map of the event (if available) to determine the order of the readers you will visit. Write Down Questions. What would you like to ask the psychic mediums or other readers you have identified? Think of 3 questions that you will ask of all the professionals during each of your readings. Arrive Early. To ensure you’ll be able to sign up with the readers you have short listed, arrive approximately 30 minutes prior to the doors opening. When the doors open, you’ll be able to use the Map Approach you identified to quickly walk through the entire fair, signing up with your short listed professionals. Record Readings. Bring a small handheld device to record each of your readings. You can also take notes, but most readers will speak a lot faster than you can write, so chances are you will miss something if you only take notes. By recording the readings, you can enjoy just listening to the reader share their guidance with you, and later compare and contrast the similarities and differences of the guidance you received on the 3 questions you posed to each reader. If you’re so inclined, you can practice my guidance at one of the upcoming metaphysical fairs at which we will be exhibiting, beginning today. Consult our Events Page for details. We hope to see you there!